It’s an age-old traveler’s dilemma: How do you to keep clothes clean while traveling around the world? Clean clothes may be easy to maintain if you’re visiting popular U.S. tourist destinations like Disney World or Washington, D.C., but laundry can be considerably less accessible (or more expensive) in places like Budapest or Addis Ababa. Here’s how to keep clothes clean no matter where travel takes you. The Expert Vagabond explains that this simple technique involves stuffing dirty clothes into a heavy-duty plastic bag (the aLOKSAK bag is a popular option). Add soap and hot water, knead the bag’s contents for approximately five minutes, and then let the whole shebang soak for another ten minutes before rinsing and hanging clothes to dry. This method can also be replicated without any special equipment. Simply use a regular two-gallon Ziploc (for small “loads”) or a plastic grocery bag. Just be sure to wash over a tub or sink to avoid puddles on the floor. Or simply bring clothes into the shower with you. The word “sink” can be interpreted pretty loosely, here — basically any container filled with water will do (in addition to sinks, think coolers, Tupperware, etc.). Life Remotely explains the simple concept: Dump dirty clothes in the sink (or container), add soap and water, swish and squeeze the clothes in the soapy water, rinse, and hang to dry. If you’re planning to use the sink method, be sure to invest in a universal drain plug (though in a pinch, a rolled up sock or washcloth will do). These are not available everywhere, and the rules and prices can vary widely around the world. Hand washing is pretty much the only guaranteed way to keep clothes clean. That said, laundromats do exist in many places, and they can be a great option for travelers looking for a deeper clean than hand washing affords. Some laundromats will have coin-operated soap dispensers, change machines, English instructions, and the like, but don’t count on this being the case. Wash and dry at clothes’ own risk! In many places, hotels, landlords, and shops offer full laundry service, and sometimes it’s worth the splurge. 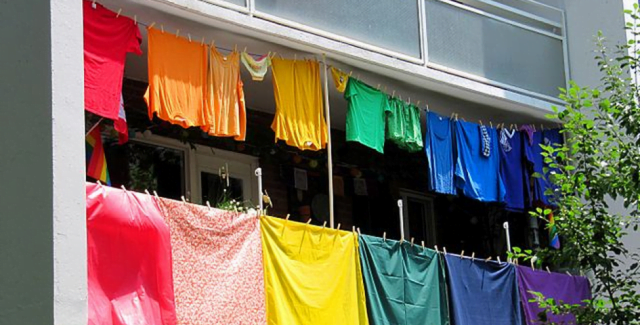 Asia in particular is well known for its high-quality laundry services. Do some research in advance of a trip to learn about the laundry situation at your destination. Many travelers decide to go the DIY approach because it’s simple, cheap, and can be done anywhere (all of this makes it a particularly great option for people traveling on a budget). If going this route, keep the following tips in mind. Bring the right supplies. A sink plug, lightweight clothesline, liquid soap (or small packets of laundry detergent), and large plastic bags will make any hand washing session more efficient and effective. If backpacking or traveling in an area with a low-quality septic system, be sure to choose a biodegradable soap. Embrace multiple wears. You’ll do laundry much less often if you wear clothes multiple times. Wait to wash clothes until they’re actually dirty. Wash small loads. It’s much more efficient to wash just a few items at a time. Each wash, prioritize underwear, socks, and the smelliest item(s) in your pack. Extend the wear of other items until washing them is truly a necessity, and then wash those items in small batches. Choose smart fabrics. Synthetic clothes will dry much faster than cotton ones, while non-wrinkles fabrics will eliminate any worry about having to press clothes. Dry right. Start by rolling up wet clothes in a dry towel and wringing them out to absorb some of the extra moisture (a pack towel is ideal, as they can absorb a ton of water and dry quickly). Then hang clothes on a line (either outside or inside) or drape them around the room in a hotel or hostel (just be sure not to damage anything with water — remember to be a respectful tourist). Don’t re-pack clothing until it’s fully dry; this will prevent mold and smelliness. If laundry is still damp and it’s time to get on the road, consider wearing the damp clothes — your body’s heat will dry them in no time. Be resourceful. If clothing gets wrinkled, hang it in the bathroom while you shower so steam can naturally relax the fabric. If clothing gets linty, use a piece of tape to pick up the worst of it. By thinking outside the box, you’ll be able to solve most any laundry dilemma. Armed with these tips, you’ll keep clothes clean and comfortable as efficiently as possible — so you can get out of the hostel and back to sightseeing. Got a good travel laundry story? Share the horror (or the success) with us on Facebook!